Fall is a delightful and convenient time to study tree leaves. What was once 80 feet overhead and practically invisible, is now directly underfoot and at hand. The Neuse River Trail, running beside the Neuse River south of the Falls Lake Dam, is home to many spectacular bottomland tree species. Huge Swamp Chestnut Oaks (Quercus michauxii) and Shumard Oaks (Quercus shumardii) can be found here, and their branches produce thousands of fall leaves that carpet the asphalt greenway. Swamp Chestnut Oaks are common in the North Carolina Piedmont and Coastal Plain bottomlands. Their leaves have wavy edges with short, rounded lobes, and are distinctive in this habitat. Chestnut Oak (Quercus montana), which has similar leaves, is not found in this wet environment, but is an upland species. In addition, Swamp Chestnut Oak leaves are widest toward the end of the blade, well past the middle, while Chestnut Oak leaves are widest in the middle. 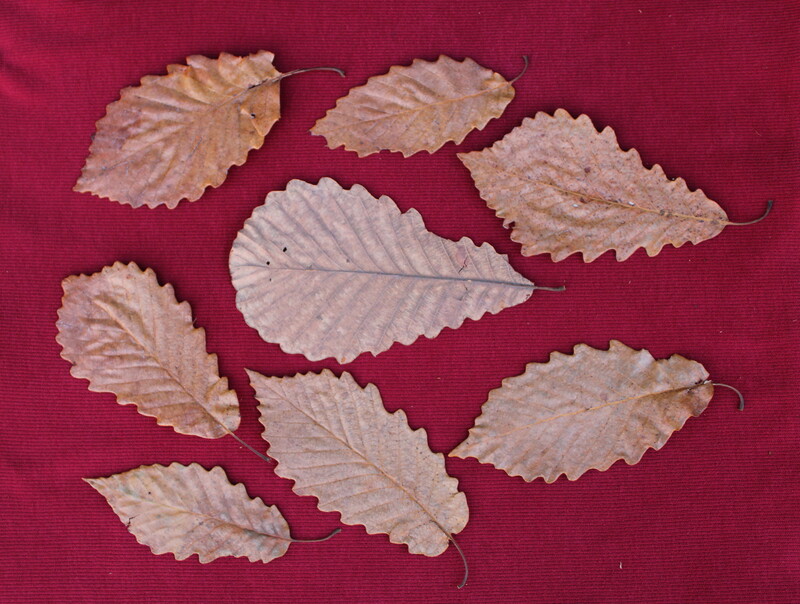 Below are Swamp Chestnut Oak leaves that illustrate the normal variability in size and shape that is commonly seen. 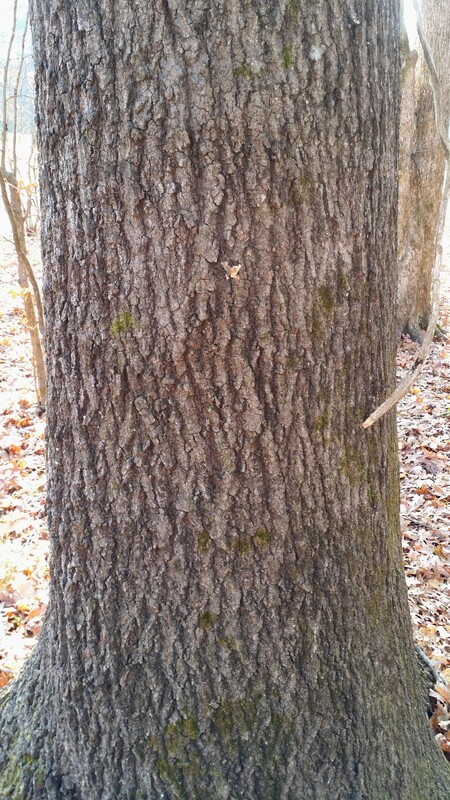 The bark and trunk of a mature Swamp Chestnut Oak is chalky and pale, with scales that loosen with age. 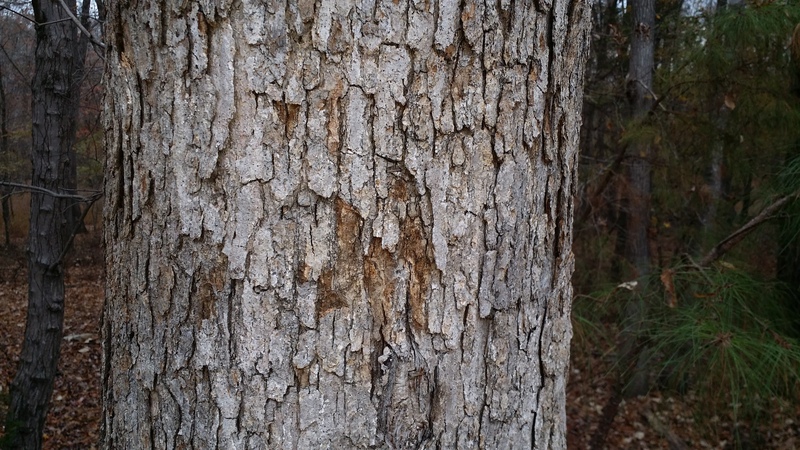 It is similar to and is sometimes mistaken for White Oak (Quercus alba). The Shumard Oak (Quercus shumardii) is uncommon in North Carolina, but can be found in sporadic populations along the Neuse River Trail. 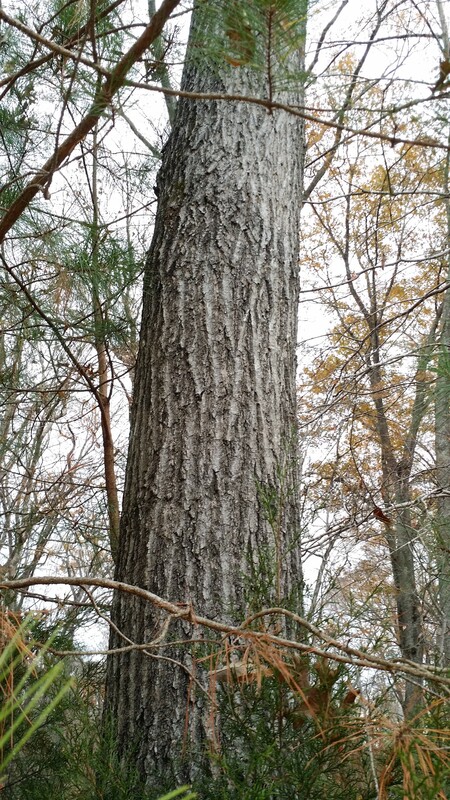 They are very tall trees, and in some cases stand directly adjacent to Swamp Chestnut Oaks. The leaves are broad and deeply cut, with many lobes and large numbers of bristles at the tips of the lobes. They present a highly dissected, intricate pattern. Several leaves below on the far left have nine lobes. The trunk of the Shumard Oak is tall and straight, and has dark furrows highlighted by light ridges that run vertically up the trunk. It often resembles the trunk of the Northern Red Oak (Quercus rubra). The gray, vertical ridges can be shiny and are sometimes referred to as “ski tracks”. Scarlet Oak (Quercus coccinea) is found in a very different habitat than Swamp Chestnut Oak and Shumard Oak, preferring upland forests and dry, rocky soils. Scarlet Oak leaves bear a close resemblance to Shumard Oak leaves. The differences can be subtle. Scarlet Oak leaves are also deeply cut but the sinuses are wide open, while the Shumard Oak sinuses tend to narrow or close, causing the sinus to have a tear-drop shape. 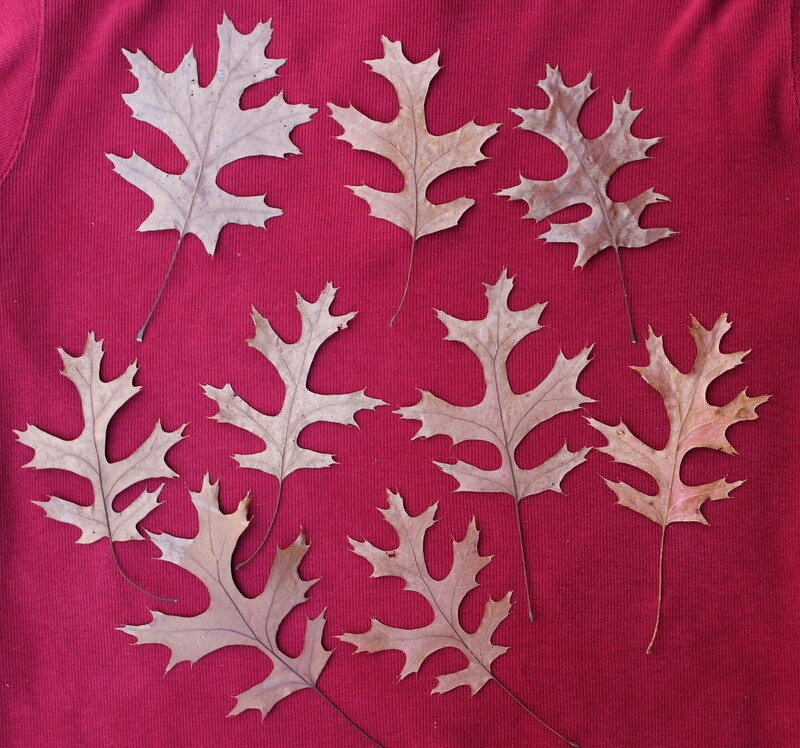 Scarlet Oak leaves tend to be proportionately narrower than Shumard Oak leaves. Nine lobes are commonly found in Shumard Oak, while they are rare in Scarlet Oaks. See the Scarlet Oak leaves below. 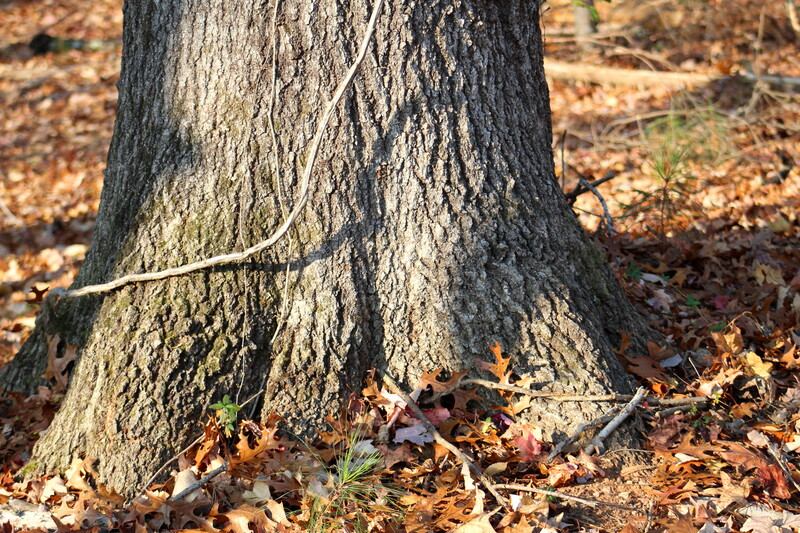 Scarlet Oak trunks have gray, low, irregular ridges, with deep furrows seen in older trees. Will Cook has an important observation about Shumard Oak leaves in his Carolina Nature website: Trees, Shrubs and Woody Vines of North Carolina. “The leaf undersides show a distinctive feature of Shumard Oak: tan tufts of hairs in the axils of the veins. Related oaks may have tufts of hairs in the veins, but they tend not to be as pale tan or as tufted.” The tufts of hair in related oaks also do not survive the seasons of wind and rain like those in Shumard Oaks. 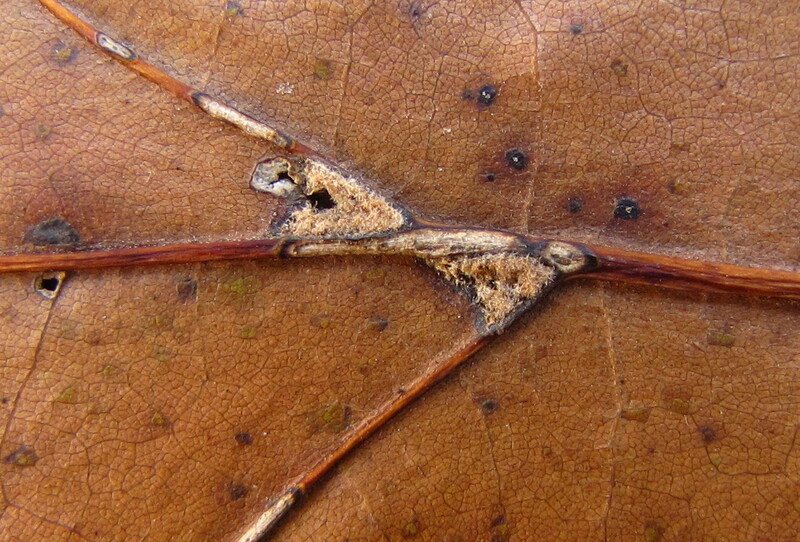 The first two photographs below illustrate the remnant hairs in the vein axils of Shumard Oak leaves. 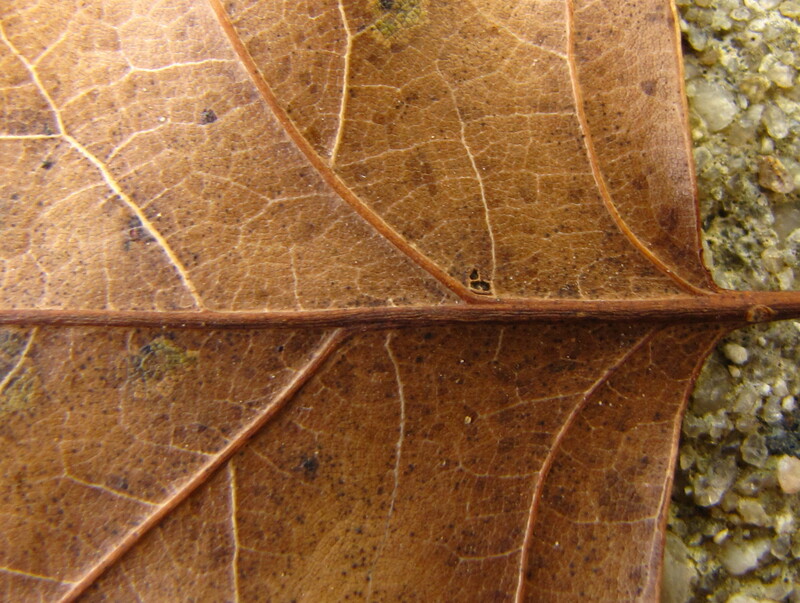 The third and final photograph is of the underside of a Scarlet Oak leaf, typical of many that were examined. It shows no visible remaining tufts of hair in the leaf vein axils. Although no single feature is absolute in fall leaf identification, this one is excellent. 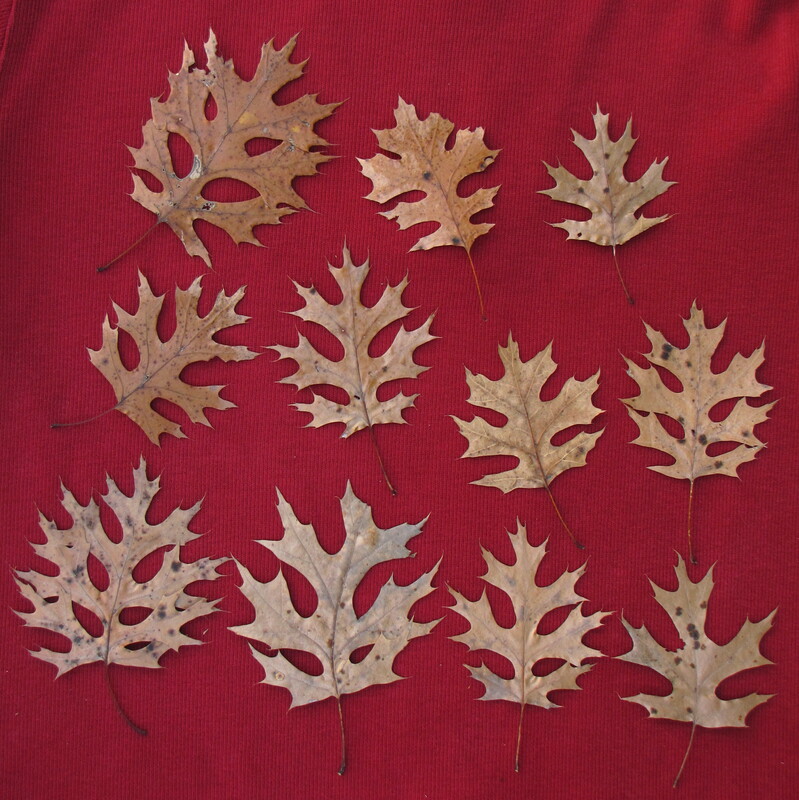 Many variables interact to affect leaf patterns and shapes. Most of the leaves in the above photographs were sun leaves, meaning they came from the upper crown of the tree where they get the most sun. Those from the shaded base of the tree tend to have shorter lobes and smaller sinuses and often are not as intricate and graceful. Leaf shape is important but is almost never used alone to confirm the identity of a tree. 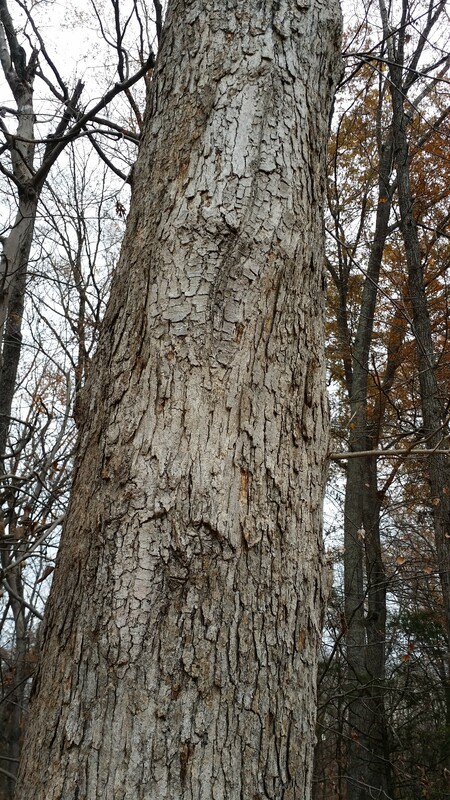 This entry was posted in Uncategorized and tagged Chestnut Oak, leaf patterns, Quercus alba, Quercus coccinea, Quercus michauxii, Quercus montana, Quercus rubra, Quercus shumardii, Red Oak, red oak group, Scarlet Oak, Shumard Oak, Swamp Chestnut Oak, tufts in leaf axils, White Oak. Bookmark the permalink.